Hotel Les Biches, located in Barbizon, has a lively atmosphere and has a unique decoration designed around the theme of deer and doe. Seasonal produce is served in the restaurant while original cocktails can be enjoyed in the lounge. Elegant furnishings as well as objects retaining the animal theme are provided in the rooms. Free WiFi is available and the private bathrooms have either a claw-foot bath or a spa bath. At Les Biches you will find a tea room that is open all day on Saturday and Sunday. Here you can sample homemade cakes while listening to the lounge music. Set on the edge of Barbizon Forest, the hotel is 7 km from Cely Golf Club. Fontainebleau, with its chateau and golf course, is a 10-minute drive away. This spacious suite features elegant furnishings, a seating area and the bathroom is complete with a spa bath. An elegant room styled with animal-shaped objects. 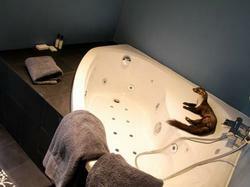 It has a claw-foot bath in the room.